Let's hope it's a good one -- without any tears. War is over. If you want it. This video is an uncut version of Anjelah Nicole Johnson's hilarious trip to the nail salon. Before the salon bit, Anjelah -- who's of Mexican and Native American heritage -- pokes fun at Latino parenting. Originally from San Jose, California, Anjelah, 27, is a stand-up comedian, actress, model and former NFL Cheerleader. And she's very funny. Being a woman of color writer is a process of self-definition and a constant search for community. Though still searching, it seems to me that nothing touches my soul more than the lyrics of those who challenge the political and cultural boundaries of American society. "Suburican" is a Boricua raised in the suburbs, in other words, me. I was socialized in a racially segregated, relatively conservative city in Long Island, Long Beach, NY. While there was always a shallow acceptance or "tolerance" of others, the school's tracking system, housing patterns, and areas of employment revealed a town that was narrowly divided around race and class. 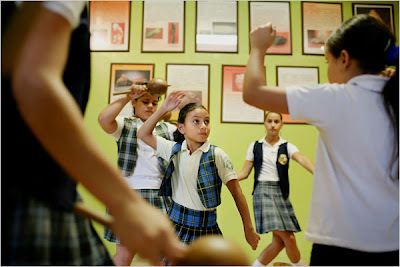 While progressive English teachers incorporated " The House on Mango Street" and "Down These Mean Streets" into the curriculum, I only knew of Latino literature as reflecting the immigrant experience and talking about "growing up." So instead of relating to author Piri Thomas as a validator of my existence, I was mostly intrigued by the lives of Henry David Thoreau, Walt Whitman, George Elliot, James Baldwin and Ralph Waldo Emerson. Like these authors, I felt alienated from my community because I saw past the "we are all the same" agenda pushed and crammed into our brains by every teacher that uttered the word diversity. Even after a 100 person race riot in our high school's cafeteria, we were still not allowed to have our own clubs based on ethnicity or talk about blatant divisions. It seemed that any time we spoke of race as an issue, we were encouraged to believe it was an illusion. 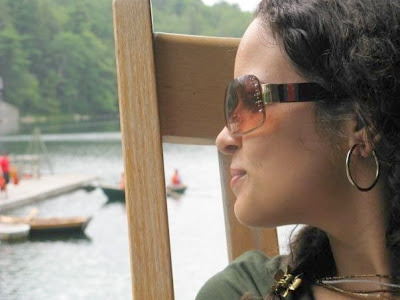 This frustration led to me to adopting the style and demeanor of the non-conformist, I was a woman poet, Puerto Rican Beatnik, my religion, transcendentalism, my music, alternative and classic rock. Reading Nuyorican poetry opened my eyes to a type of Latino literature where the poet was symbiotic with a social movement, living in another dimension, testing boundaries. Lawyer James F. Castro-Blanco, 50, has declared his intentions to run for the position of Yonkers City Council President in the '09 municipal elections. Yonkers with 200,000 residents is tied with Upstate Rochester for third place. However, with twice as many Latinos than Rochester (28k), Yonkers (60k) has no Latino on its City Council. Castro-Blanco hopes to fill that void by presiding as the council's leader. If he wins the GOP's backing, he'll be pitted against one term incumbent Democrat Chuck Schorr Lesnick. Yonkers is a middle-class city in New York's Westchester County abutting the northern border of the Bronx. It's a city that has had major issues with racial segregation in housing and in its public schools. Accordingly, its politics at the mayoral level has been dominated by Republicans--although the council is now under Democratic control. Castro-Blanco is with the Wilson Elser law firm's White Plains office. He graduated from Brooklyn Law School ('91) and the State University of New York at Albany('88). 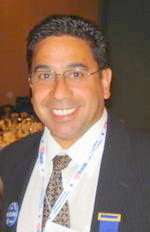 And he's a member of both the Association of the Bar of the City of New York and the Hispanic National Bar Association. He also Past President of the Puerto Rican Bar Association and of the Puerto Rican Bar Association Annual Scholarship Fund. Castro-Blanco is a member of the Board of Directors of PALS and of the Yonkers Puerto Rican/Hispanic Day Parade Foundation. Not to be outdone by Jennifer and Angelina, Ricky went and had his own twins--Matteo and Valentino--via surrogacy. And they're adorable! As per Hollywood tradition, Ricky's now 4 month old babies are introduced to the world via the cover of People, too. Jennifer and Angelina collected seven figure fees for their work; unclear what was Ricky's take. But that's not what's important, is it? It's really all about the babies--and they're really very cute. Enrique Martín Morales (aka, Ricky) tells the magazine he's balancing his career while caring for twins himself. What? No nanny for Ricky's little hombres! Hmmmm. Either the next installment of La Vida Loca can be done very quietly from his tropical mansion or his partner--not that I'm saying he has one--is on diaper duty. One question: What's with the Jacksonesque grasp? In this clip, Marga Gomez talks about the emotional high of Barack Obama's election followed by the low of the California Gay marriage ban. She knows how to turn pain into laughter. It's a skill she honed as a young woman. The daughter of Cuban comedian Wilfredo Gomez (aka, Willy Chevalier) and Puerto Rican dancer Margarita Estremera, Marga was raised in Manhattan and Long Island's Massapequa. (Talk about extremes!) It was her experience as a lonely and only Latina at the Massapequa High School, along with the family performance gene that she credits with turning her onto comedy. Gomez continues to workshop this intoxicating comedic memoir of her awkward adolescence in Massapequa, Long Island, mixing equal parts cultural confusion, chronic virginity, mother-daughter instability and a splash of polyester fashion to paint a sardonic picture of her uprooted life as the new brown girl in a white high school. From Miss Gomez to “jaded lesbian,” Marga Gomez grows up? 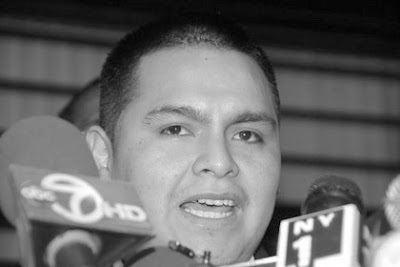 Another Latino has been murdered in the glacial moraine known as Long Island. Jose Osvaldo Sucuzhañay and his brother Romel were savagely attacked early Monday morning by a gang wielding beer bottles and bats. Jose was pronounced brain dead yesterday. The attack occurred in the Bushwick section of Brooklyn (Southwestern Long Island). As in the killing of Marcelo Lucero a month earlier in Patchogue, Long Island, and the earlier slaying of Luis Ramirez in Shenandoah, PA, the attackers were a hate-filled pack of thugs prowling the night in search of victims. In all three cases, the gangs zeroed in on Latino immigrants walking home. Unlike the other murders, the attackers in Bushwick were Black and they escaped in an SUV. In addition to using anti-Latino slurs, the attackers used anti-gay slurs in the mistaken belief that the brothers were a gay couple. The domestic war against Latinos escalates with Jose and the Sucuzhañay family as its latest victims. But while nativists focus like a laser beam in waging their ugly war, the larger community of decent Americans are asleep at the switch. The result is that it's literally open season on Latinos--especially on the most vulnerable working late hours and travelling on foot or bicycle. Told You So...Nativist GOP is a Loser! Since this December '06 post, I have been warning the GOP that nativism against Latino immigrants is a political loser -- and they would seal their own fate in '08 if they didn't change course. Between then and the election a few weeks ago, I wrote over two dozen posts on this very issue. (See links to some below). 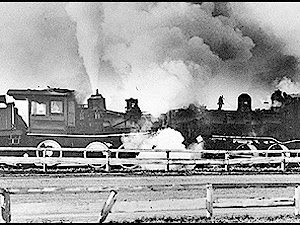 A train wreck was coming. But the GOP turned deaf. Of course, they wouldn't listen to a pro-immigration Latino blogger, but they tuned out their own as well. It was like they collectively covered their ears and yelled nah, nah, nah, nah...at the top of their lungs to tune out the warnings of Linda Chavez, Clint Bolick, Mel Martinez, George W. Bush, Wall Street Journal and John McCain and others. I'm not one to say 'I told you so', but I really did warn them early and often. And I'll tell them again. Nativism may help marginal politicians in loser districts and counties. BUT IT WILL DESTROY ANY POLITICAL PARTY IN AMERICA THAT PURPORTS TO BE MAINSTREAM. Period! Nativism is both an individual as well as a social illness. And today's GOP has an especially virulent strain. It's an illness which causes its victims to think and behave irrationally, including self-destructing. Unfortunately, the self-destruction is usually proceeded by feverish frenzy to bash those outside the tribe. The following are a few articles since the election in support of what I've been saying for two years. Republicans: Fenced In By ImmigrationUntil now, the conventional wisdom has been that illegal immigration is a wedge issue that works to mobilize “the base” in the Republican Party, win over swing voters frustrated with the problem, and hurt Democrats who support comprehensive immigration reform. Conventional wisdom has also held that the number of Latino voters who could hold anti-immigrant politicians accountable for their rhetoric is too small to make a difference outside of Democratic strongholds. This election stands that conventional wisdom on its head. Immigration wasn't a dominant issue this fall, and other factors contributed more to the GOP defeat. But the political reality is that Republicans who thought that channeling Lou Dobbs would save their seats will soon be ex-Members. Hispanics voted 67 percent for Barack Obama, playing a key role in flipping Colorado, Nevada, New Mexico and Florida to the Democratic column. Even more frightening for Republicans is the strong possibility that Latino voters could soon deliver Texas and Arizona to the Democrats. If this happens, Republicans can turn out the lights on their presidential hopes, lock the door and go on vacation for a decade or three. Immigrant rights groups are casting an eye toward five newly elected, pro-immigration-reform senators they hope will examine immigration issues in a different light. They are Mark Warner of Virginia, Mark Udall of Colorado, Kay Hagan of North Carolina, Jeanne Shaheen of New Hampshire and Tom Udall of New Mexico. Hispanic Panic for the GOPWhat happened? Many blame the debate over comprehensive immigration reform, which produced fierce legislative showdowns in 2006 and 2007. "It was the tone of the debate," says Diaz-Balart. "The tone of some Republicans was offensive to the vast majority of Hispanics." He believes this "had a devastating effect" on the party's standing with Latino voters. A major measure that would have given illegal immigrants a path to citizenship failed last year after a revolt from conservatives, who denounced it as an amnesty for lawbreakers. "If they do that again, it's going to be catastrophic for the Republican Party," he said. According to an analysis by the Democratic group NDN, Latinos were key to Obama's victory. The challenge now, he said, is that [George W. Bush and John McCain] who represented the best hope for Republicans to connect with Latino voters on issues that matter to them, particularly immigration, have been spent. Latinos Rising to Lance a Nativist GOP? The Rightwing's Winning Strategy on Immigration - NOT! 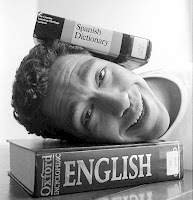 Latino USA's Maria Hinojosa speaks with comedian Bill Santiago about his new book, Pardon My Spanglish ¡Porque Because!. 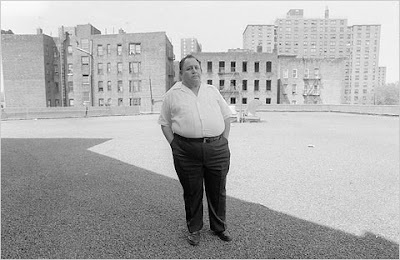 Acknowledging Ramon Vélez' place in the history of Bronx community and political life, Falcón believes that it would be dishonest to obscure the less savory aspects of the man. He has called for a critical assessment of the man many Bronx Latinos knew as Padrino. In A Second Look at a Bronx Baron’s Methods, NYTimes columnist David González, who hails from the Bronx and later covered Vélez at the pinnacle of power, begins that process. González -- as does Falcón -- takes a classic progressive lens to Vélez. As such, he sees a bare knuckles politico who used the social welfare system to enrich himself and monopolize local politics. He likens Velez to Tammany Hall's George Washington Plunkitt, a City politico from a century ago who became wealthy by means of what he called "honest graft." There's an honest graft, and I'm an example of how it works. I might sum up the whole thing by sayin': "I seen my opportunities and I took'em." But I'm not sure that self-enrichment through "honest graft" is the only issue here. Certainly, it's still a key part of the art of politics as practiced across the City and beyond. For example, Hillary Clinton commodities futures bonanza, Al Sharpton's suits, Charlie Rangel's four rent-controlled apartments, school superintendents with half a million a year pensions, etc. What bothers González and many others is that Vélez not only enriched himself with funds intended for the poor, but that he flaunted it. Additionally, he succeeded in institutionalizing a corrupt political culture that continues to do great harm to the people of the Bronx. Velez was a significant player/actor in the Latino history of the Bronx, but to Gonzalez and Falcón, he leaves a troubling legacy. Instead, González points to Evelina Antonetty and Antonia Pantoja as truly worthy examples of Bronx community leaders who made great contributions and built enduring institutions and legacies, but did it without enriching themselves or using tainted politics. The death of Vélez, the infighting among Bronx Latino pols, combined with the defeat of José Rivera as Bronx Democratic Party Boss, may signal the beginning of the end to Latino 'Patrino' politics. Padrino, El Jefe, El Gordo, Emperor of the South Bronx, Activist or Power Broker - Ramon S. Vélez; R.I.P. Beloved by the poor and maligned by his political enemies when he dominated South Bronx politics, Ramon Santiago Vélez Ramirez, the former South Bronx anti-poverty baron and political godfather died Sunday after a long battle with Alzheimer's disease at age 75. He is survived by his wife, Caroline Fitzpatrick; six children; six grandchildren; two sisters; and a brother. Vélez' burial took place in his hometown of Hormigueros, Puerto Rico, where he was born and raised. A graduate of Puerto Rico's Interamerican University with a degree in History and Polit ical Science, he studied law at the University of Salamanca in Spain and he served a stint in the U.S. Army. Vélez has received honorary doctorates from The World University of Puerto Rico, Peoples University of the Americas, and Mercy College of Dobbs Ferry, New York. And is work has been recognized by the City of New York, the Assembly and Senate of the State of New York, and several Presidents of the United States. Vélez started his career as a school teacher in Puerto Rico, but switched to social work when he arrived in New York City at age 28 in the early '60s. 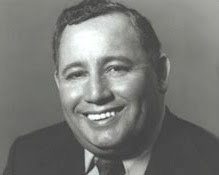 With a $50,000 grant from the Johnson administration’s war on poverty, Vélez began his accent as the undisputed master of government fundraising. No wilting flower, Vélez fought to secure a "fair share" of federal anti-poverty funds for the people of the South Bronx -- a long neglected community that was literally left to burn. In the process he established himself as a political force in New York. National and local political candidates of both major parties trekked up to the Bronx for Vélez' blessing. His formidable political network is credited with producing leaders such as former Bronx Borough President Fernando Ferrer, Congressman Jose Serrano, State Senator Ruben Diaz, Assemblyman Ruben Diaz Jr., and former Assemblyman Roberto Ramirez. Although [Vélez] served just a single term in the Council and ran unsuccessfully for Congress twice, Vélez was the political godfather to a number of Bronx politicians — from United States Representative José E. Serrano to members of the City Council and State Senate. And, in many ways, in a city with a storied legacy of political bosses, he became the first Puerto Rican political boss. His most celebrated political triumph a hugely successful voter registration drive that produced nearly a half million new voters, most of them Puerto Rican. Q: Remember in the '80s when it was fashionable to bash poor people of color -- e.g., Ronald Reagan's Welfare Queen? NYC's Ed Koch at the time pandered to the outer borough 'Archie Bunker' voters by blasting Velez as a "Poverty Pimp". It was a so thinly veiled racism, IMHO. But at the funeral service Koch had this to say about the smear: [It] "was based on rumor. But when we investigated him, we could find no corruption. From that point on, we were friendly with each other." Really! So Vélez' reputation was stained for 25 years based on a lie? We learn at the man's funeral that the attacks on him were just politics? Nonetheless, Vélez was a bigger than life character -- everyone agrees. But as with others operating between the gaps of unrelenting poverty and a tide of government money, it's easy to see where personal ambition can at times trump the public good. Some argue that that's the case with Vélez. So instead of rushing to canonize El Difunto, Angelo Falcon calls calls for a more sober assessment of the life and times of the very mortal Ramon S. Vélez. May he rest in peace. 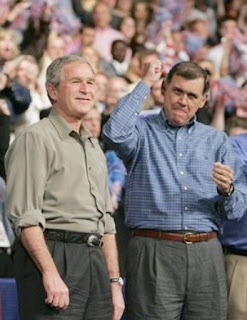 The Hill is reporting that Republican Senator Mel Martinez will NOT run for re-election in Florida in 2010. Caught between Republican nativism, Bush incompetence, and a changing Florida, Martinez has chosen to step aside and not seek re-election. 5) and Florida's continuing movement from Red to Blue state. However, Martinez and the GOP were in trouble when Bush felt compelled to install Martinez as RNC chairmen in the aftermath of the massive defeat of the administration's pathetic efforts at immigration reform. Hmmm. A Latino Chairman of the Republican Party promising to create a party in which Latinos as well as African Americans are comfortable is refreshing. Certainly, Bay Buchanan and Tom Tancredo can't be lovin what they’re hearing. Well, the careening, belching LOCO-motive crushed him.